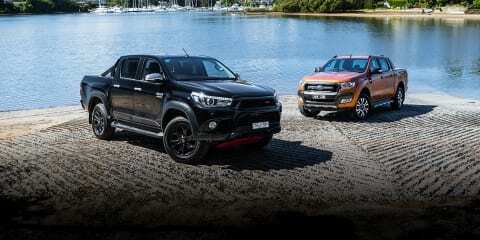 This really is the battle of the big guns – the most expensive versions of the Ford Ranger and Toyota HiLux, fighting for the title of the sportiest lifestyle ute. They’re both more popular than any SUV on the market, with buyers choosing these high-riding, five-seat vehicles to get around even if they don’t use the tray for its intended purpose. These two vehicles aim to cash in on that trend. Both are the high-end offerings in their respective model ranges, with the Ford Ranger Wildtrak having been around for quite some time, while the newly added Toyota HiLux TRD (or Toyota HiLux SR5 with TRD accessories, as the company labels it) having just arrived on the scene. These two are shopped by tradies and foremen alike, as well as white-collar types who want to look like they know their way around a worksite. According to the Japanese maker, the new HiLux model is “the boldest, most aggressive looking production HiLux yet”. We’d tend to agree. The Ranger Wildtrak has its own blend of aggression, though we’ve come to see so many of these on the road, it isn’t quite as commanding as it once was. We’ll leave the final decision on styling preferences to you. With the Ford closely trailing the Toyota on the sales charts, and with sales of both on an upward trajectory, the importance of halo models like these is paramount. But which is better? Let’s find out. These two utes encapsulate the fact that pick-ups are no longer the realm of the struggler – far from it, in fact, with each commanding large sums of spend. The more affordable of the two is the Toyota, priced from $58,990 drive-away [note – an earlier version of this article stated this price before on-road costs] for the manual version, and $60,990 for the auto model we have here. The black paint is a further $550 (the only other option for this spec is white, at no cost) making the price of our truck $61,540. Ford’s Ranger is dearer from the outset. Like the Toyota it is offered with a six-speed manual (from $59,590) or six-speed automatic ($61,790) before on-roads. Our vehicle, as tested, is $62,340 with its Pride Orange paint. If you could get a Ranger with that list price as its drive-away cost – meaning no on-roads – there’d be $800 between the two. So what does the Ranger get you that the HiLux misses out on? Well, it’s quite a bit, actually. Let’s start with safety tech, where the Ranger betters all-comers in the commercial vehicle segment with the most up-to-date active equipment available. It has adaptive cruise control, forward collision warning and a lane departure warning system fitted as standard in this spec, and the HiLux has none of those. While both have a rear-view camera, the Ranger has front and rear parking sensors with a visual display. It doesn’t just stop with safety kit in terms of the stuff the Toyota is missing: the Ford betters it with the latest phone mirroring technology, including Apple CarPlay and Android Auto, and it has an extra USB point (two, as opposed to one). The Ranger has dual-zone climate control where the HiLux has single zone, and the Ford’s front seats are heated, unlike the HiLux’s. The Ford has an auto-dimming rear-view mirror, where the ‘Lux doesn’t, and both utes have electric driver’s seat adjustment, but manual passenger seat controls. It’s plain to see, then, the Ranger wins the battle of pricing and equipment, but still, both are comprehensively equipped – and that’s not to say that the HiLux doesn’t offer some items that the Ranger doesn’t have. For instance, the Toyota comes with keyless entry and push-button start (the Ford still has a regular old key without smart entry), LED daytime running lights and LED headlights (the Ranger doesn’t have DRLs and has projector halogen lights with auto high-beam), and the HiLux’s seats are leather lined in their entirety, unlike the part-leather/mostly cloth chair trim of the Ranger. We’ve already mentioned the safety story is really strong for the Ford, but it doesn’t have as many airbags as the Toyota. The HiLux has seven (dual front, front side, full-length curtain and driver’s knee), where the Ranger misses the knee protection. One of these feels like a regular ute with not much done to make it feel special inside, and the other is the Ford Ranger Wildtrak. The HiLux TRD is a standard SR5 with a set of TRD carpet mats and a TRD gear knob. And that’s it. We know this isn’t specifically a derivative in the model range – rather an accessories pack add to the flagship – so differentiating it from a run-of-the-mill ‘Lux inside is hard, but the Japanese brand surely could have added some naff faux carbon-fibre trim or something else to spice up the cabin…? It isn’t as though the HiLux’s cockpit is a dire habitat, but it certainly feels the less impressive of these two in terms of presentation. The contrast in terms of the materials used is stark: on the dash-top of the Ford is a fake leather trim with orange stitching, while that coloured cotton also finds itself on the doors, gear selector and steering wheel. The black head-lining makes it feel more special, too, not to mention the fact is has more soft touch points on the doors and centre console. Further, the Ranger has a pair of digital displays for the driver that sit either side of a central analogue speedometer, and those small screens can display a digital speed readout, tacho, safety info, navigation, audio management and more. The HiLux doesn’t even have a digital speedo. We’ve already mentioned the Ford has the latest phone connectivity, but the screen in the Ranger is better, too. The Sync 3 system is simpler to use, quicker to load, offers better resolution and menu layouts, and doesn’t block you from doing things when you’re driving like the Toyota’s system does. The one in the HiLux won’t even allow you to call someone from your contacts list if the car is moving, nor can you input navigation controls. We can’t understate how big of a pain this is – oh, and the Toyota’s navigation instructions will talk over your phone calls, if you manage to make one! The attention to detail in the Ranger is considerably better as well: for example, further to the tilt and swivel adjustment in the HiLux, the Ranger’s sun-visors have slide adjustment, meaning you can position them if the sun is beating in from the side; and the grab-handles in the Ford are retractable, where the Toyota has hard fitted handles that could pose a problem for taller occupants, particularly off-road. All that said, the Ford has a few little sketchy issues with its fit and finish. It isn’t to the extent we saw in the Ranger XLS we drove in our recent mega test, but the Wildtrak still has a few loose fitting plastics, like around the tops of the pillars and on the kick-plates. No such issue with the Toyota, with excellent fit and finish – just like our Workmate model had in the same budget ute test. Both vehicles have 220-volt plugs for charging things like laptops, with the Toyota’s socket in the centre console bin and the Ford’s placed a little more logically on the outside of centre box with easy access to those in the rear seat. There’s an array of 12-volt plugs, too. The HiLux has a ventilated storage area above the glovebox for keeping drinks cool, but neither has rear-seat air vents. One nice plus for the Toyota is its auto up/down windows on all four doors; the Ranger only has auto up/down on the driver’s door. Cabin storage is pretty good for both, with cupholders front and rear (both have flip-down centre armrests) and there are bottle holders in the front and rear doors of both, with the Ford having slightly smarter, deeper pockets in its doors. The Toyota has bigger map pockets in the back, and it has a pair of flip-out shopping bag hooks, too. The Toyota’s rear seat is a little tighter for headroom and width, but the knee-room and toe-room is about equal if not a little better than the Ford. You’ll fit five adults in both if you need to, but if kids are more likely to populate the second-row seating there are dual ISOFIX anchor-points in both utes, not to mention three top-tether attachments – it’s worth considering the Toyota has loop-type ones that poke out the top of the fixed rear seatback, where the Ford, which has a back seat rest that can be dropped down, has its top-tether points mounted to the wall. Both utes feature rear seat bases that fold up and can be held in place like that: the Toyota’s base flips up in a 60:40 layout, which is pretty handy, where the Ford’s seat base is a single piece, but it has larger storage pockets underneath. There’s another complaint common to both of these utes, and while it seems a trivial one, ask any owner of the current models and they’ll agree: each of these utes bings, beeps and bongs too much. Leave the key in the Ford? It’ll bing at you. Unlocking the Toyota? There are a few beeps for that. It’s enough to give you the shits. As for mixing business and pleasure, the two are pretty closely matched for tray capacity, but the Ford has a few extras. Both have tub-liners with four tie-down points and each has a cargo cover at the rear, the Ford’s being a hard roller-top and the Toyota’s a soft tonneau. The Ford’s tray has a 12-volt outlet and a light, unlike the Toyota, and its tailgate is lockable, as is the roller top; there’s no security of that sort for the Toyota. In this grade, both have tow-bars fitted as standard too, but neither gets electric trailer braking as standard. Payload is higher for the HiLux at 925 kilograms compared to 907kg for the Ranger, but the Ford has a higher braked towing capacity of 3.5 tonnes, compared with the Toyota’s 3.2 tonne capacity (both have 750kg towing for trailers without brakes). Despite the TRD badges, there’s nothing Toyota Racing Development has done to the thing under the bonnet. So it retains its 2.8-litre four-cylinder turbo diesel engine with 130kW of power (at 3400rpm) and 450Nm of torque (at 2400rpm), and nothing has been changed to the six-speed auto apart from the TRD gear-knob. That’s still a shortfall to the Ranger, with its turbo-diesel five-cylinder engine churning out 147kW at 3000rpm and 470Nm of torque at 2500rpm, with a six-speed automatic taking care of swapping between cogs. The HiLux’s grunt disadvantage is noticeable on the road, but it’s not as marked as you might think. Sure, the Ford feels more effortless in the mid-range, but that vehicle has a bit more turbo lag from a standstill under hard throttle and runs out of puff sooner the higher the revs go. The Toyota, in comparison, is a little more linear in its progress, and it’s mostly quieter as well. The Toyota’s transmission offers decisive shifts, and if you engage the drivetrain’s Power mode the gearbox holds the engine in gears a little longer, making easier work of load hauling if you need it, while also improving throttle response. If you’re just running around town without a load on, you won’t need it. The Ford may not have the best refinement and while it can be a little sluggish if you flatten the throttle at a stop, if you’re a little more measured with your right foot application you’ll notice that the thing feels more urgent, such is the throttle sensitivity. We’ve found in the past that the throttle touchiness can be a bit annoying off road, because it isn’t as easy to modulate. There’s bugger all in it in terms of claimed fuel use: Ford’s larger capacity engine is said to use 8.9 litres per 100 kilometres, compared with the Toyota’s smaller four-pot at 8.5L/100km. That’s on paper, at least: the Ford used more like 11.2L/100km on test, compared with the Toyota at 10.1L/100km. If the drivetrains were a relatively close match, road manners is where the Ranger categorically thumps the HiLux. Whether it’s steering, suspension composure, body control or comfort, the difference between the two is vast, despite the fact the Ranger was designed and engineered in Australia and the HiLux saw plenty of local development and engineering feedback (650,000km worth, according to Toyota). The Ranger acts and reacts like an SUV – in fact, it does things better than many SUVs out there, and with a level of suspension resolution that belies its workhorse roots. Its ride isn’t necessarily supple, but it is a lot better sorted than the Toyota: it doesn’t fall into potholes, stumble over road-joins or shudder at the rear when there’s nothing in the tray. The Toyota still feels like an old-school work truck in contrast, with suspension that is firm to the point of being unyielding. Rather than ride over inconsistencies in the road it will feel flummoxed by them at times, with the tray trembling as the chassis attempts to absorb sharp-edged bumps. The steering is another example of Ford making its ute easier to live with – its electric system offers finger-tip lightness at low speeds, despite requiring more turns from lock to lock, and at higher speeds it is nicely weighted and with good precision and directness. If steering the Ford at low speeds is like stirring a cup of tea, the HiLux’s steering is more akin to stirring a jar of half-set cement. It is considerably heavier, on the verge of being hard work at times, particularly when you’re trying to park: despite having a quicker rack, you can’t just zip into and out of parking spaces – it requires a bit of heft. At pace the Toyota’s tyres offer better grip, and its firmer suspension means it corners a little flatter than the Ford, but we’d take a touch more tyre squeal and body-roll as a compromise any day. The Dunlops on the Toyota are grippier at the nose, for what it’s worth. And if you do a lot of night driving, its LEDs are considerably better at low and high beam than the Ranger’s yellowy halogens. We’ve driven both of these pick-ups off road extensively in the past, and while that wasn’t part of the criteria for this test given their premium intent, we’ve found that both offer very good performance away from the blacktop, but with similar characteristics: the Ford is softer and more malleable, the HiLux stiffer yet strong on control. Each has a switch-on-the-fly four-wheel-drive system, hill descent control and a locking rear differential to ensure good traction in the worst of situations. The HiLux’s reputation for reliability is well known, but it and the Ranger only have three-year/100,000 kilometre warranty plans – not as good as you get from Mitsubishi or Isuzu, for example. Both of these models have capped-price service plans, but with varying requirements in terms of intervals. As we’ve reported before, Toyota requires its HiLux models to visit the workshop every six months or 10,000km, whichever occurs first. The Ranger can deal with visits every 12 months or 15,000km. That means that over 60,000km, you’ll visit the Toyota service centre an extra two times – that could be two down days, if you use it as a work vehicle – where the Ford will need four visits. There’s a consideration when it comes to the cost of maintenance over that time: the Ford will cost $1905 over 60,000km, while the Toyota will cost a fair bit less: $1440 for its six visits in 60K. In the end, the outcome isn’t unexpected: as decent as the Toyota HiLux TRD is, it can’t match the Ford Ranger Wildtrak for equipment, and nor can it offer the same level of comfort for occupants due to its sharp suspension, nor ease of driveability because of its heavy steering. The HiLux TRD is arguably the best looking version of the ute yet, with the styling extras making it stand out from the pack. Its equipment levels are good, but not great, for the money, and there’s bound to be plenty of people who opt for it over the Ford. They could do a lot worse. But the Ranger Wildtrak remains the flagship lifestyle ute to dominate all others: its focus on convenience and comfort makes it a pragmatic alternative to an SUV, and that’s probably exactly what it will be used as. Safety-wise it sets the pace, and while it isn’t cheap, you get a lot of value for money. And perhaps most importantly, it feels its price on the inside as well as the outside.